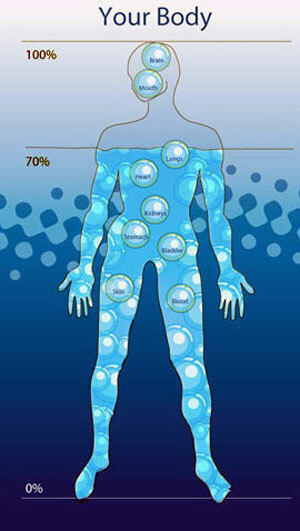 The human body consists largely of water — muscle tissue, for example, is a surprising 75%. In the course of a normal day, we lose some of this water, and, like a car with a leaky radiator, if we don’t constantly replace what we lose, we can go from well-oiled machine to wheezing wreck. Everyone has seen television footage of marathon runners stumbling towards the finish line, their disorientation and spastic-like movements clearly indicating an extreme state of dehydration. These graphic images highlight the crucial role that water plays in virtually every bodily process, and the problems that can occur when it is deficient. Many health practitioners believe that a large proportion of the North American population suffers chronically from mild dehydration. This condition is blamed for symptoms such as fatigue and poor metabolism and it may also contribute to the development of other illnesses, including rheumatoid arthritis, high cholesterol and blood pressure, and many of the diseases associated with aging. How could such an abnormal situation come about? A poor diet, deficient in moisture-rich fruit and vegetables, is no doubt partly responsible. Another food-related cause is that people don’t seem to realize they are thirsty anymore: Apparently, 37% of the population mistakes thirst for hunger. This causes them to compound their health problems by overeating. For these people, a simple glass of water may be the best diet they ever tried. People are often surprised to learn that they can lose 2.5 liters of water per day despite minimal activity. Even while sitting on the couch watching television, water is lost with every breath. Obviously, the higher temperatures and increased physical activity of summertime will markedly increase the amount of water that most of us will lose each day. How much water do we need to drink to be fully hydrated? As a starting point, The Institute of Medicine advises men to drink 3.0 liters (13 cups) per day and women 2.2 liters (9 cups). You should then estimate whether your bodyweight and level of activity warrants more or less than the average person and set that as your daily goal. What is the best source for our daily water quota? Health authorities advise us to minimize alcoholic, caffeinated, and sugar-rich beverages because of their poor hydrating qualities. Fruit juice is expensive and sometimes sugar-laden. The simplest solution –ordinary tap water –is highly variable: It is often so over-processed that it tastes “dead” and is devoid of any useful nutrients. Conversely, it can be a foul-tasting chemical cocktail. Many turn to bottled water as an alternative, but this is expensive, inconvenient, and a lottery in regard to composition. So, is there another option available that can provide good-tasting, effectively hydrating water at an affordable price? Yes there is: ­home ionized water. Those who have sipped from a clear mountain stream have experienced the sort of water that our bodies have been designed by nature to respond to. The main reason for the refreshing taste of wild, flowing water is that it becomes ionized as it crashes through the countryside, picking up naturally occurring alkaline electrolytes along the way. But it”s much more than just a nice tasting drop that encourages us to fully hydrate. The alkaline nature of this water enables it to act like an expensive sports drink, neutralizing the acids that build up in our bodies due to normal metabolic processes and exercise. The electrolytes also act as antioxidants, scavenging for free radicals that, if left unchecked, progressively degenerate our body tissues. Fortunately, we don’t have to head into the wilderness every time we want to benefit from nature’s perfect hydrating fluid. A water ionizer is a device that turns ordinary tap water into clean alkaline ionized water –every time the tap is turned on. It purifies and enhances domestic water in a two-step process. First, harmful contaminants are filtered out, and then electrolysis is used to split the flow into two separate streams: ionized alkaline water for drinking and cooking; and ionized acid water for other household uses. Users of water ionizers often describe the taste as “smooth and silky”. And it’s not only the taste that entices people to willingly consume their full daily ration; many find that their long-lost innate thirst returns after making the switch. This is surely a clue that ionized water is a product that we should be consuming. Other users, especially athletes, enthuse about improvements in their performance and general wellbeing since making ionized water their beverage of choice. They believe that the product’s high oxygen-carrying capacity coupled with its ability to rapidly hydrate and treat lactic acid buildup have contributed to their progress. Modern consumers have become justifiably wary of the hype and unsubstantiated claims that surround many “breakthrough”health products. The benefits and cost-effectiveness of water ionization, however, can be verified by independent laboratory results and comparative tables.